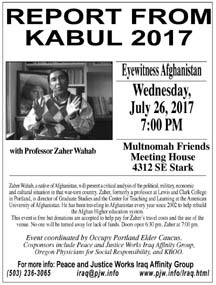 On Wednesday, July 26 at 7 PM, Dr. Zaher Wahab, a native of Afghanistan, will present a critical analysis of the political, military, economic, and cultural situation in that war-torn country. The presentation will be at the Multnomah Friends Meetinghouse at 4312 SE Stark in Portland. Wahab, formerly a professor at Lewis and Clark College in Portland, is Director of Graduate Studies at the Center for Teaching and Learning at the American University of Afghanistan. He has been traveling to Afghanistan every year since 2002 to help rebuild the Afghan higher education system. This event is free but donations are accepted to help pay for Wahab's travel costs and the use of the venue. No one will be turned away for lack of funds. Co-sponsored by Occupy Portland Elder Caucus, Peace and Justice Works Iraq Affinity Group, Oregon PSR, and KBOO.